Evan Hiestand puts up a shot from underneath in the first half of Versailles’ home game with Lima Central Catholic on Tuesday night. The Thunderbirds won the game, 69-56. 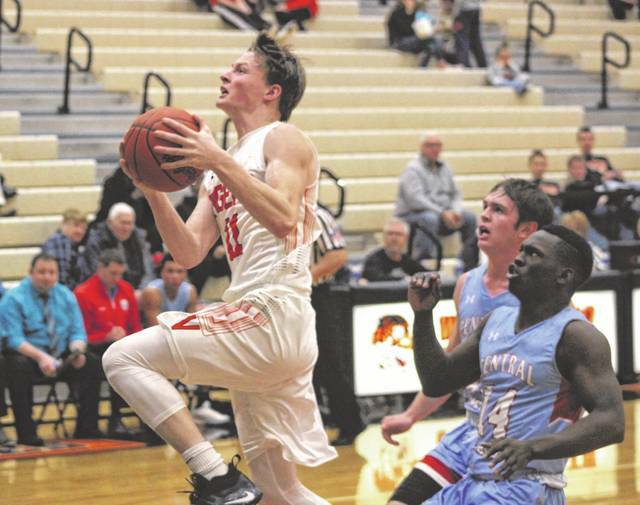 Michael Stammen scored two of his game-high 21 points in the first half of Versailles’ home game with Lima Central Catholic on Tuesday night. The Thunderbirds won the game, 69-56. Cody Naftzger sees a Lima Central Catholic defender closing in on him near midcourt in a non-league matchup on Tuesday night. The Thunderbirds won the game, 69-56. Connor VanSkyock drives toward the hoop with a Lima Central Catholic defender chasing him in a non-league game on Tuesday night. The Thunderbirds won the game, 69-56. Hunter Trump puts up a shot from underneath in the second half of Versailles’ home game with Lima Central Catholic on Tuesday night. The Thunderbirds won the game, 69-56. Ryan Martin goes in for a layup in the first half of Versailles’ home game with Lima Central Catholic on Tuesday night. The Thunderbirds won the game, 69-56. The Versailles varsity cheerleaders entertain the crowd during a break in the action of the Tigers home game with Lima Central Catholic on Tuesday night. The Thunderbirds won the game, 69-56. Evan Hiestand drives toward the basket during the second half of Versailles’ home game with Lima Central Catholic on Tuesday night. The Thunderbirds won the game, 69-56. Michael Stammen shoots a 3-pointer during the first half of Versailles’ home game with Lima Central Catholic on Tuesday night. The Thunderbirds won the game, 69-56. 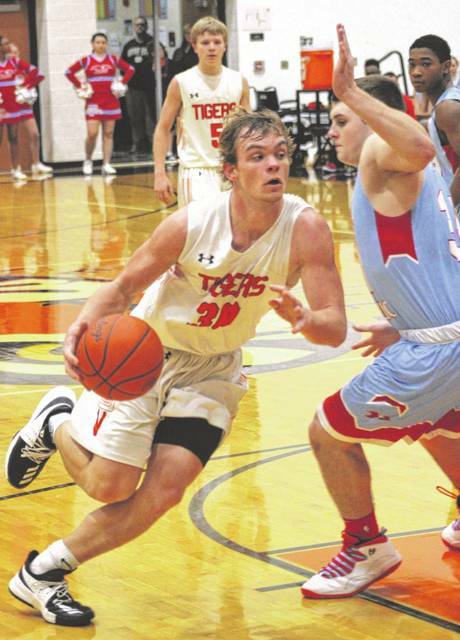 VERSAILLES – Versailles came back from a 10-point deficit in the first half, but could not overcome a 13-point deficit in the second half in falling to visiting non-league foe Lima Central Catholic on Tuesday night, 69-56. 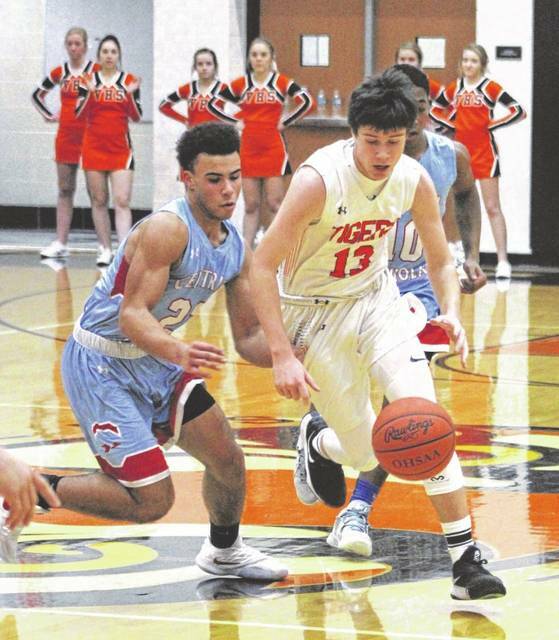 The Tigers found themselves in an early 13-3 hole in the first quarter, but rallied largely behind 18 points from sophomore guard Michael Stammen to lead the Thunderbirds 32-26 at halftime. 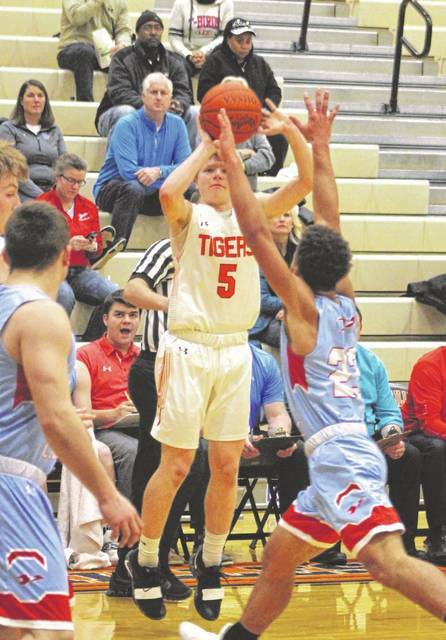 However, Stammen was held scoreless until late in the fourth quarter as the Thunderbirds outscored the Tigers 16-0 over a four-plus minute stretch to surge back in front to stay in the third quarter. 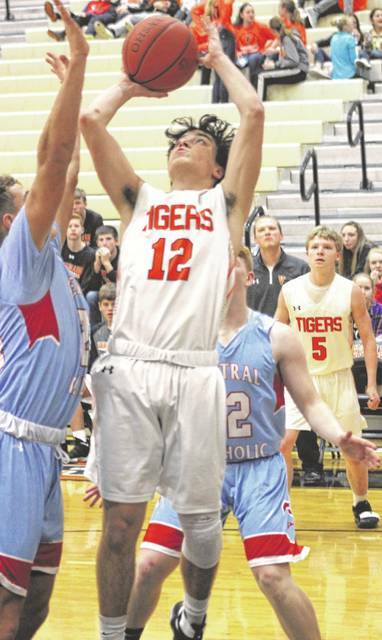 Versailles did get back to within four points in the early going of the fourth quarter behind an 8-0 run all by Evan Hiestand, but could get no closer as Lima Central Catholic closed out the final minutes for their eighth win of the season. 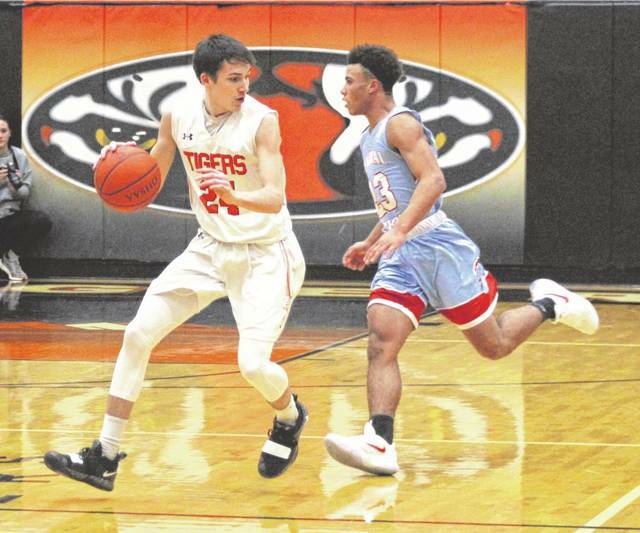 “We did a fairly good job keeping them in front and making them take longer and tougher shots but I’ll bet they had 40 some points just off fast breaks so we have to clean that up,” Versailles coach Travis Swank said. “We did a fairly good job keeping them in front and making them take longer and tougher shots, but I’ll bet they had 40 some points just off fast breaks so we have to clean that up. Lima Central Catholic coach Frank Kill said among his second half objectives was to take the ball out of Stammen’s hands and the Thunderbirds were successful in that as Stammen didn’t score until 13 seconds left in the game when it was out of reach for the Tigers. Stammen had a game-high 21 points. 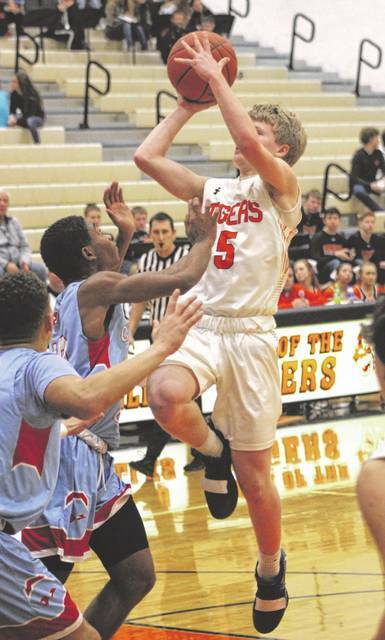 Kill also knew his team needed to clamp down on Versailles senior Evan Hiestand, but Hiestand made that a much more difficult challenge as he scored 10 of his 14 total points in the second half including an 8-0 run in the fourth quarter that got his team to within four points of the Thunderbirds (54-50). “I thought Evan had a really good spurt for us there in the fourth quarter at crunch time,” Swank said. “We got it down the floor and then we have a silly mistake – a turnover here and we can’t get a stop down there. Really we got outhustled for just the second time all year. I felt like we were outhustled in the Loramie game and tonight as well. You know I like our kids heart. I will never take that away from them. They have played hard all year long, but tonight we just didn’t have our juice. They had more than what we did so that is a credit to LCC. Kill praised his guys for stepping up in the second half, particularly the third quarter. Garner led the Tunderbirds with 14 points followed by Jay Riepenhoff with 12. Versailles returns to action on Friday at St. Henry in a Midwest Athletic Conference showdown. Lima Central Catholic – Biggz Johnson 5 4 14, Jeremy Allen 1 0 2, Nate Stolly 3 1 9, Dominic Riepenhoff 3 2 8, Shaun Thomas 3 2 9, Rossy Moore 0 1 1, Jay Riepenhoff 4 4 12, De’Montre Garner 7 0 14. Totals: 26 14 69. Versailles – Michael Stammen 5 8 21, Ryan Martin 4 1 9, Connor VanSkyock 1 0 3, Cody Naftzger 3 0 7, Evan Hiestand 4 6 14, Austin Toner 1 0 2. Totals: 18 15 56. 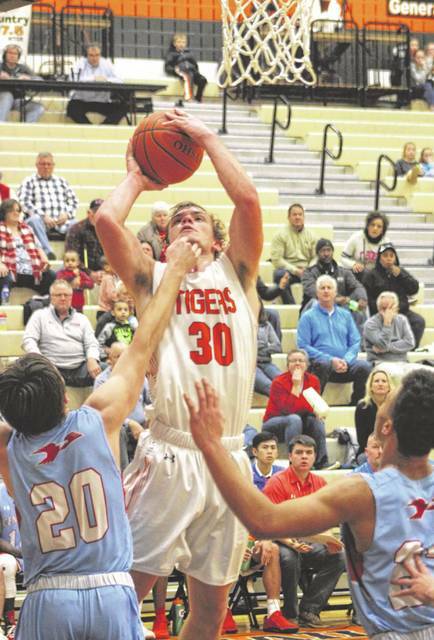 3-pointers – LCC 3 (Stolly 2, Thomas 1), Versailles 5 (Stammen 3, VanSkyock 1, Naftzger 1).